Philanthropy Northwest supports members’ census efforts across our region through a variety of activities, including programming (convening events, webinars and meetings); participating in state working groups of funders and community partners; connecting funders to 2020 Census funding opportunities and resources, peers and experts across the region and nation; supporting outreach around advocacy opportunities; and developing state-level factsheets and tools. For more information, visit our main 2020 Census page. On April 1, 2019, we officially launched a statewide pooled fund with more than a dozen funding partners. 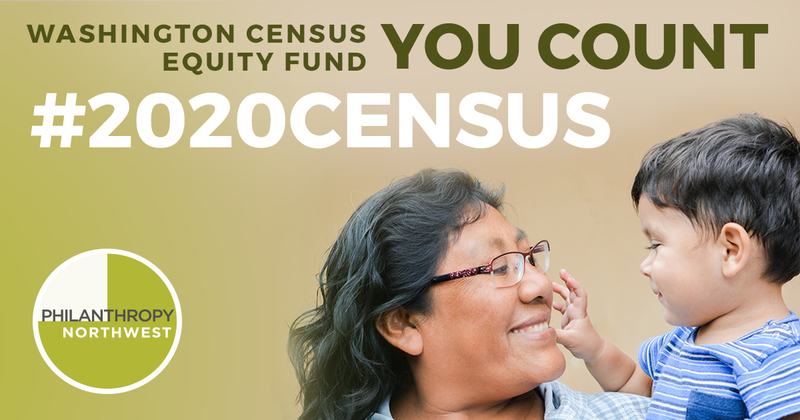 The Washington Census Equity Fund will align collective advocacy and grantmaking strategies to ensure communities across the state are fully counted in 2020. To learn more about the Washington Census Equity Fund and how to contribute to the fund, visit the Washington Census Equity Fund page. Read more about our collaborative efforts including a full list of fund partners in this press release. Organizations, tribes and tribal organizations across Washington state are invited to apply for funding to support census planning and mobilization, or education and outreach in hard to count communities. Visit the Equity Fund page to see the complete funding opportunity announcement and to apply online. Applications to the Equity Fund are due on May 15, 2019, at 5 p.m. PDT. Our work in philanthropy has repeatedly demonstrated the critical importance of accurate data to make good, thoughtful decisions in how we invest in communities. There is a once-in-a-decade opportunity to ensure an accurate count. Philanthropy Northwest supports efforts, led by the Washington Census Alliance, to advocate for state funding to ensure that hard to count communities are counted across Washington state. On March 31, the Seattle Times published an op-ed we co-authored with the Bill & Melinda Gates Foundation and the Seattle Foundation. The Census Equity Fund, an initiative of the Democracy Funders Collaborative Census Subgroup, supports state and regional efforts to prepare for and conduct outreach to encourage full participation in the 2020 census, with a focus on historically undercounted populations. The Request for Proposals for a new round of grantmaking is open until April 8, 2019. The fund is prioritizing proposals from specific states, including Alaska and Montana. On March 11-13, a delegation of Philanthropy Northwest members made its annual trip to Washington, DC, to join nearly 250 philanthropic partners for visits to congressional offices to advocate on key policy issues affecting the philanthropic sector. Full federal funding toward the census was a top priority. of Washington during Foundations on the Hill 2019. The potential addition of a new and untested question about citizenship status to the 2020 Census form is one of the most detrimental decisions to undermine the 2020 Census, threatening to depress participation, distort data, increase costs of the census and damage public trust. Philanthropy Northwest joined a letter submitted by United Philanthropy Forum on behalf of 33 regional and national philanthropy-serving organizations, calling on the Commerce Department to withdraw a citizenship question from the 2020 Census. Philanthropy Northwest also submitted our own letter.